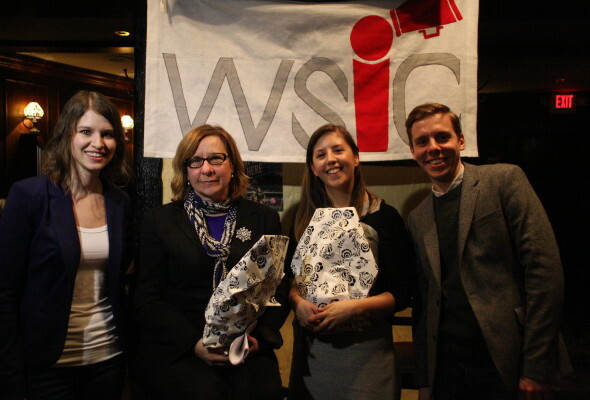 On Wednesday March, 4 WSIC Uptown held their first event at their new location: the Rose and Crown at Yonge and Eglinton. There was a huge turnout and the audience was clearly excited to discuss the limitations on free speech, the challenges of protecting free speech and some of the free speech-related conflicts happening in the world today. Kathy English, the Public Editor for the Toronto Star, kicked off the discussion. Kathy began by explaining her complex responsibilities: it is her job to act as a reader advocate, guarantee accuracy and serve as a liaison between The Star and their readers. Kathy briefly outlined the existing limits on free speech, namely the law, including libel and fair comment laws. She then discussed the complaints she often receives from readers, mostly those who are offended by what they read. Kathy stressed that columnists differ from reporters and columnists are allowed to have their own opinion, although it must be based on some type of provable, fact-based evidence. As Kathy stated, “columnists are entitled to their outrageous opinions, but they are not entitled to mangle their facts”. Kathy also shed some light on the Star’s decision to not publish the Charlie Hebdo cartoons, as the Star deemed the cartoons to be offensive, based on their policies and values. Kathy argued that the Star believes in freedom, but not unfettered freedom. Rather, it must be within the sense of responsible journalism. Though we have the right to publish the cartoons, they are not always in good taste. Turning to how The Star does push boundaries, it has been aggressively attacking “secrecy”, namely in the government and in regulatory bodies, as they believe this is information that the general public needs. Whether or not the information passes the “public good” test is often a deciding factor in whether or not it makes publication. Katie Gibbs brought insight from the science perspective, particularly in regards to the recent muzzling of federal government scientists. Katie is the co-founder and Executive Director of Evidence for Democracy, a national, non-partisan, not-for-profit organization that promotes science integrity and the transparent use of evidence in government decision-making. Katie began by setting the context: for decades, Canadian science journalists were able to pick up the phone and call a government science. Then, all of the sudden, this suddenly was forbidden. Katie explained the culture of fear that exists both within the federal and provincial public services, as well as the limitations placed on accessing information, including ridiculous levels of approvals and layers of bureaucracy. Katie placed this issue in a larger context and stressed that not allowing taxpayer-funded scientists to speak publicly is a disrespect to taxpayers. While we accept that freedom of the press is essential for democracy, Katie stressed that this cannot exist if the press has no one to talk to. The tables have turned so sharply. Katie cited a former National Post science journalist who once complained that government scientist would phone her up trying to get their stories published. After getting denied interviews, journalist, not ones to give up easily would make Freedom of Information requests that revealed long and comical chains of approvals that would be funny if not so damaging to democracy. This veil of secrecy placing 9 levels of approvals on scientists before the green light to speak to journalists is relatively new. Kathy added that The Star would spend millions a year on FOI requests only get boxes upon boxes delivered of blacked out material. As the audience consisted of many scientists, it was clear to see that they were very engaged with the topic and very eager to add their insights and ask some questions. Many of the topics were diverse, ranging from whether the government asks the press not to cover specific stories, to the role of journalists in perpetuating misinformation, due to a lack of math and science comprehension. Media was attacked in general for not hiring enough people with basic math and science skills. In response, English acknowledged that the Star fell short when they released their investigation of HPV vaccines and said the editorial team is taking steps to ensure that a similar situation does not occur again but she herself is not involved in that level of decision making. A particularly notable moment was when Katie championed the need to remain positive and encourage dialogue with those dissimilar from us. Instead, she stressed the need for a positive dialogue for us to better understand other people’s values, interests and motivations. This response was met with a rousing round of applause. Both Kathy English and Katie Gibbs’ expertise are unparalleled and their knowledge led to a fantastic and thought-provoking conversation. We would sincerely like to thank both of our panelists to coming to chat with Why Should I Care and giving us a lot to think about!